If you have any questions or want to enquire about dates, use our form to contact Philipa Stephenson. You’ll feel it’s gone all quiet here surrounded by bucolic fields and woods, but you’re only a ten-minute drive from Clifton village and all the thrills and spills of Bristol. Philipa and Matthew meet and greet but otherwise leave you be and you’ve got your own patch of very pretty garden so your privacy is unsullied. 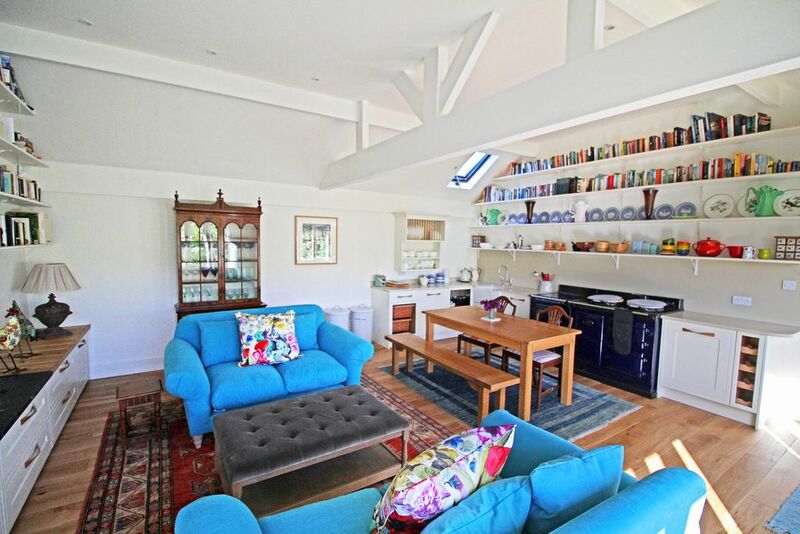 Walk straight in to a light and airy open plan space with walls of books, high ceilings, wide wooden floorboards and windows with views; two enormous squishy sofas sit in front of the wood-burner for snuggling up on chilly nights. The swish kitchen has enough kit to keep a serious cook happy – you can even go all Mary Berry and use the Aga, but there’s a conventional hob for the less adventurous. The two bedrooms and a bathroom with a proper bath are off here: find one big double and one very small one (best for ardent lovers) with thick new mattresses and French quilts. Walks are from the door, good pubs are near and there’s a vineyard and orchard here – join in with wine/cider making in the autumm. We stayed in this cottage for a few days. It was very comfortable and had everything that we needed. The aga made it very warm and cosy. Very close to Bristol, we used the park and ride, which was nearby. Very quiet setting. The owners where very friendly and left us delicious bread and fresh eggs. We loved it and would go back again. Walk from the door on public footpaths. If you're feeling energetic, The Gordano Round is a 26 mile hike which passes within 100 yards of the front door, taking in Portishead, Clevedon and lots of open countryside. Shorter options also available! Try the bars, coffee shops and restaurants of Clifton Village a 10 minute drive away, including a recently opened outpost of the Ivy and the best curry house in the West! Tyntesfield National Trust house and grounds is a 5 minute drive away. The house is a Victorian Gothic masterpiece, the gardens include a walled vegetable garden, rose garden and orangery and there are 540 acres of land to explore. Ideally situated for Ashton Court, home of the annual International Balloon Fiesta (August) and the Let's Rock Bristol! music festival in June. Explore Bristol's nautical history with a trip to the SS Great Britain, Bristol's top visitor attraction. Or time your visit to coincide with the annual Harbourside festival (July). For cultural highlights, see the Welsh National Opera at the Bristol Hippodrome (usually October and March), or visit the Bristol Old Vic or the Tobacco Factory for live theatre.